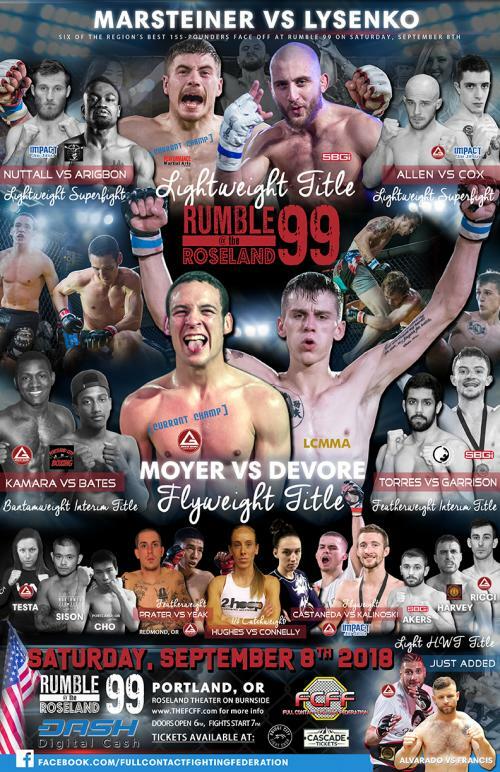 The Full Contact Fight Federation (FCFF) is back at the Roseland Theater this Saturday, September 8thfor Rumble at the Roseland 99. That’s right, this is the FCFF’s 99thshow dating all the way back to Rumble at the Roseland 1 in January of 2002. 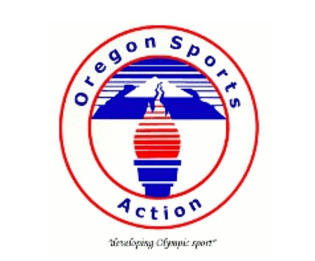 Over 16 years later, the promotion that has become the number one organization for amateur fights in Oregon is bringing it harder than ever and this weekend is no exception. With sixteen total fights and five of them being title bouts, this card is definitely worth the price of admission. Let’s breakdown a few of these fights. This light heavyweight title bout is on the short list for fight of the night. Both fighters are former heavyweights who love to strike and it would seem that this fight is tailor made for the slugfest lover in all of us. While Francis is relatively unknown on the local scene, he actually spent a brief period of time training at Gracie Barra with his opponent. Although the time was short, it seems that it was enough for him to gain some confidence. Shortly after Alvarado’s last fight, a decisive knockout victory, Francis reached out to the FCFF and asked for a matchup with Alvarado. 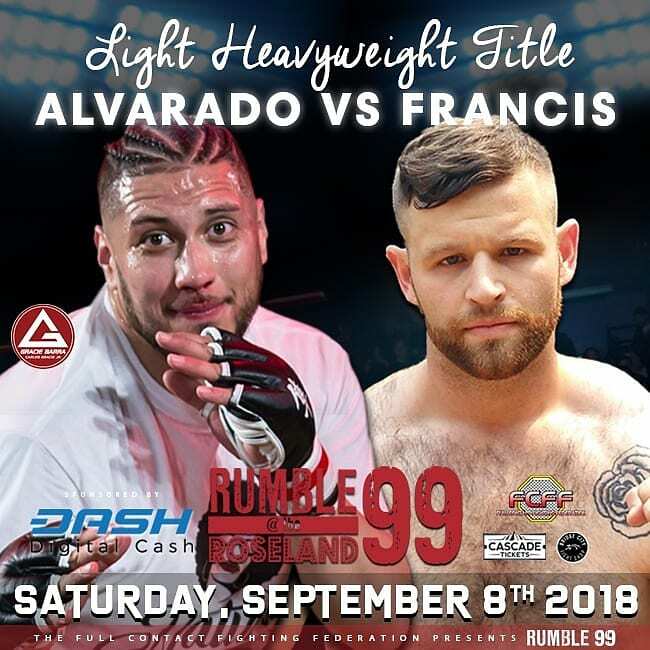 A fight with Alvarado is not usually something that comes by request so this matchup is surely welcomed by the folks at the FCFF and it would seem Alvarado is excited about it as well. He was nothing but positivity and smiles at the recent FCFF press conference. He mentioned that he is in the best shape of his career and anyone paying attention knows that is true. Alvarado has been more than focused over the last two years, and his journey from heavyweight to light heavyweight has been well documented over social media. This fight has the potential to end early, and I’d expect both fighters to be looking for the finish in round 1. As far as hometown favorites go, it would appear that Abdul Kamara is going to have the entire Roseland Theater cheering for him. 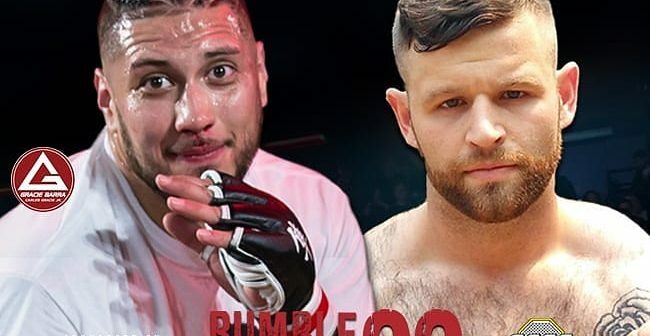 Not only is Kamara a homegrown talent and a Gracie Barra representative, he is fighting a guy who has been openly dismissive of the Portland fight scene. Kamara has returned to Gracie Barra and has shown a renewed energy leading up to this fight. Somehow, he hasn’t allowed the comments of Bates to get in his head and for the most part he appears excited and ready for the fight, which is huge for Kamara. Many have said that Kamara is his own worst enemy; he has all the talent but has folded to pressure in the past. His current demeanor does not suggest that he is anything but prepared this time around. Bates is an interesting character. He is 6-0 and all those fights took place over the span of about a year. He has showed no signs of slowing down but a recent move from Nevada to Oregon has not sat as well with him it would appear. He has stated that Portland is “weak” and he has mentioned that he isn’t fighting for the FCFF; he is just collecting a belt. The only positive thing he had to say was about his new team, Curt’s Ultimate Fitness. Bates tone changed when asked about his new training camp; he was very complimentary of coach Curtis Crawford. Bates has yet to face anyone with the experience of Kamara and this should be his toughest test to date. This fight could easily be a grudge match in the making and bring Bates back to the FCFF should he suffer a defeat. As of late, you cannot mention the FCFF without hearing the name Keaneo Moyer. He has been a polarizing figure whose talent in the cage almost plays second fiddle to his charismatic personality. Moyer has been vocal about this fight with Tim Devore being his last as an amateur; he appears to have his sights set on going pro but will round out his time in the amateur ranks with a tenth fight. Devore is a teammate of the only person to ever defeat Moyer (Sage Farnworth) and the idea of exacting a little revenge likely makes this fight sweeter for him. Taking it a step further, Moyer has stated that he does not feel Devore is on the same level as him and even went on to say, “You should be very thankful right now, that I even took this fight with you.” The confidence of Moyer appears to be at an all time high. Devore has be absent for the press events leading up to this fight but he is surely getting some tips from Sage Farnworth that he can try and use against Moyer. Tim Devore is no slouch, he is riding a four-fight win streak into this matchup but stopping the momentum of Moyer is one hell of a task. Moyer’s prediction, “done in one” happens to be my prediction as well. I don’t know for sure who wins but there is no chance either fighter is looking to coast into a multiple round affair.